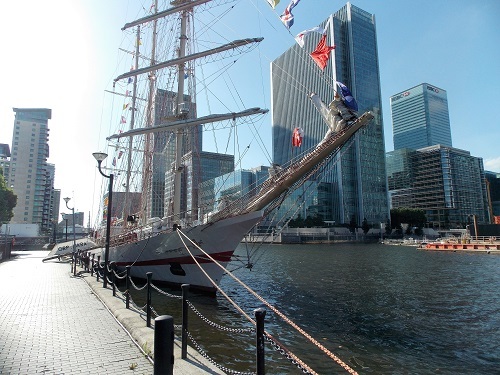 After a quiet period in West India Docks, we welcome the Sailing Vessel ORP ISKRA which is a Polish Navy training ship. 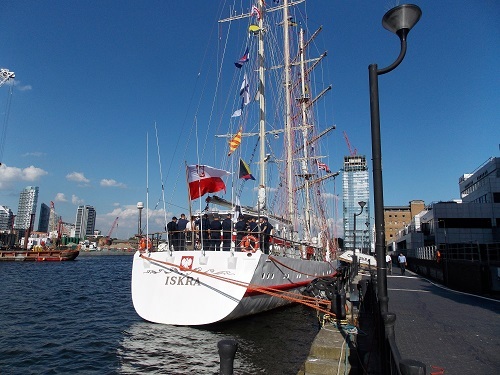 Like many navies around the world, Poland use their sailing ships to train cadets. The ship was built in Gdansk Shipyard and was launched in 1982. ORP ISKRA is one of three sailing ships in the Polish Navy, the others that were also built in the 1980s are the Pogoria and Kaliakra. 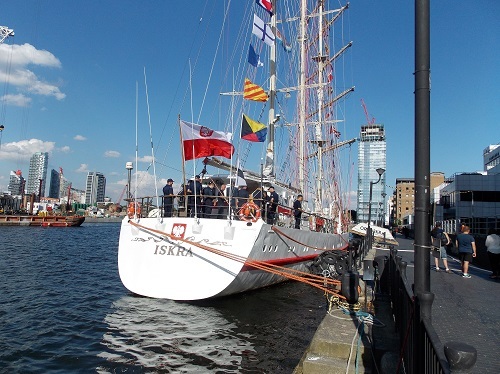 ORP ISKRA is the second sailing ship in Polish Navy with the same name. The original had a remarkable history and sailed for over 50 years. 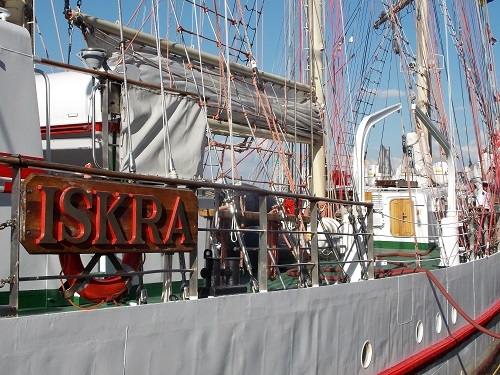 ORP ISKRA is a three – masted barquentine and has participated in a number of Tall Ships races and is a familiar sight in ports around the world. 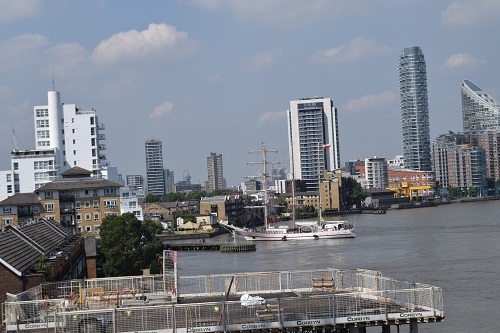 It is not known how long the ship will be in the dock but is the latest of a number of tall ship visitors over the last 18 months. Whilst not one of the larger Tall ships. 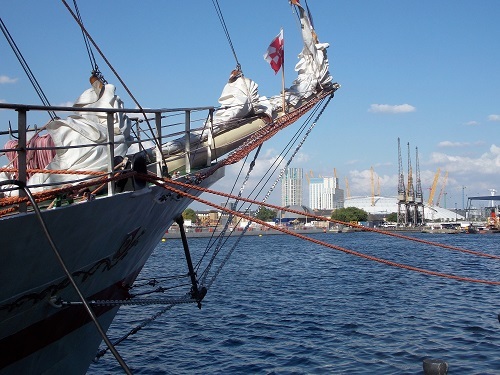 It is remarkable to consider that ORP ISKRA has sailed around the world a number of times and offers its crew and cadets the thrill of sailing in all the major oceans. 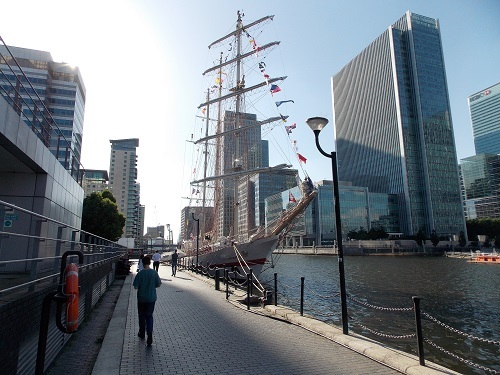 Eric Pemberton managed to get a photograph of the ISKRA entering West India Dock. By isleofdogslife in Dock Life on July 20, 2016 .